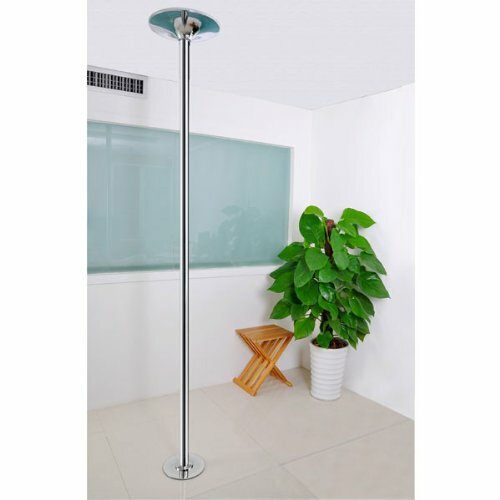 This pole dance pole is a spinning and stationary in one with the latest size - 45mm. It is thinner than the older style 2" pole, but wider than the brass permanent poles that you often see in clubs. This pole is fully removable, height adjustable and portable. It only takes minutes to put up and take down. You can take it to your pole dancing classes, to your friend's, or just practice or spice up your parties at home! •45mm (1.96") Pole as used by the professionals. •Finished in the ideal finish for pole- High grade electroplated chrome. •Static or spinning (6 ball bearings), two hidden screws to lock/unlock. •Extendable from 2170mm (85.5"/7ft) to 2700mm (106"/8.8ft) straight from the box. •Screw together tube high precision joints(almost seamless) for maximum strength, stability and smoothness. •Easy to use height adjuster with cover. •Articulating base, easy to set up on uneven floors. •Double width pole support dome, spreads the load/pressure evenly on the ceiling. •Angular stability lock, helps stabilization your Pole. •Optional extensions 125mm and 250mm(Included in this package). •Comprehensive assembly instructions & DVD included. •Well packed in compact and individual protected tubes package. 45mm (1.96") Pole as used by the professionals. Finished in the ideal finish for pole- High grade electroplated chrome. Static or spinning (6 ball bearings), two hidden screws to lock/unlock. Extendable from 2170mm (85.5"/7ft) to 2700mm (106"/8.8ft) straight from the box. Screw together tube high precision joints(almost seamless) for maximum strength, stability and smoothness. If you have any questions about this product by B&D Inc, contact us by completing and submitting the form below. If you are looking for a specif part number, please include it with your message.